It all started in 1957 when a Parisian pharmacist with a fascination for phytotherapy and aromatherapy founded NUXE. In 1989, Aliza Jabes took over the brand and did her best to revive a pioneering cosmetological concept combining nature, health and beauty. Aliza Jabes' unchallenged passion for plants combined with a gifted anticipation of women's needs allowed NUXE to become a unique brand, with strong beliefs in its roots and authenticity. The numerous awards received by NUXE over the years tell the tale of brand integrity that is praised by both professionals and consumers. 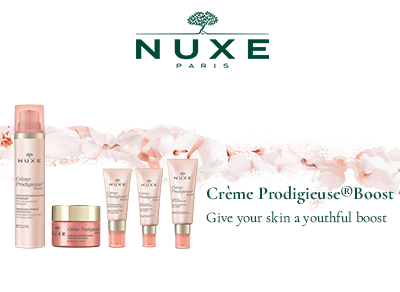 Nuxe: a brand whose name means Nature and Luxury. From a young age Aliza recognised the importance of therapeutic remedies that are extracted from the world of plants, as her father was a research pharmacist. There are five fundamental qualities of the NUXE brand that guide her on a daily basis: nature, innovation, evaluation, accessibility, and sensoriality. Each product must include all of these philosophies in order to best provide performance and pleasure. For NUXE the power of plants is infinite, as they are an inexhaustible source of creativity and in-depth effectiveness. To date NUXE have 32 patents in submission, a testament to the dynamism of the quality ingredients and the innovation of its researchers. A product is only launched if its safety and effectiveness are proven through rigorous testing and objectives carried out under dermatological supervision. The products contain no mineral oil, no substances of animal origin, and no parabens. The original recipes are non-comedognetic and are tested independently in vivo and in vitro biometrological for their efficacy. Alongside this, NUXE continually contribute to the preservation of the environment in their selection of recyclable materials and a reduction of box sizes.